For the past 3 months I have been so wonderfully fortunate to spend time as a volunteer teaching in paradisaical, Rarotonga. Although I was able to volunteer in another part of The Cook Islands, Aitutaki - I spent my teaching hours in Raro. As a Polynesian woman; I'm half Samoan. I was thrilled to see Twinkl's expansion of resources that focused on New Zealand Maori, Samoa and other Pacific Islands. While in the pacific, and teaching Pasifika students for the first time I was eager to teach about islands other than The Cook Islands. And most of my students (aged 9 and 10) knew very little about their Polynesian neighbors. In my primary school class where I was relieving for 3 weeks, I decided we would have a literacy week. All things literacy - reading, reading activities and strategies, writing, spelling and decoding. For our reading material I chose a handful of Jill MacGregor's fantastic books from her Children of The Pacific collection. They are spectacular books with beautiful photographs of Polynesian kids from around the Pacific talking about their homeland's traditions, language, celebrations and more. A real dream collection of books for Pasifika teaching and Pasifika students. Alongside the reading, I did a range of reading activities from the Twinkl website. The kids had a lot of fun. Before anything, I had the class set up into teams. Then, we would read one of MacGregor's books and after, I started a competition between the groups. In teams they would , round by round, have to complete reading activities that I downloaded from Twinkl's Reading Activity Resource Pack. I didn't use all the pack, but I did use the Find 3 Adjectives and make 3 sentences worksheet, the noun worksheet that's similar in style as well as the making words from the Author's name. These challenges were fun to complete in groups and I would award points for the first team finished but additionally, I made sure to award more points for the best and most creative answers. Round by round, I could see the students had comprehended parts of the book we had read. The first day we read 'Dharma's Diwali' - which was great for these reading activities as this particular story has a short story within it, that summarizes 'The Story of Diwali' in easy to read and understand text. Moreover, the reading activities Twinkl have that can be applied to just about any book - are great for literacy exercises and in general, reading comprehension activities. However, the reason for my blog post's title - Hire a Pasifika Adviser is something I don't say lightly. I truly think Twinkl needs to step it up in their Polynesian resource department. When browsing for resources of the Pacific, on their site, I was happy to find a few Samoan themed resources. 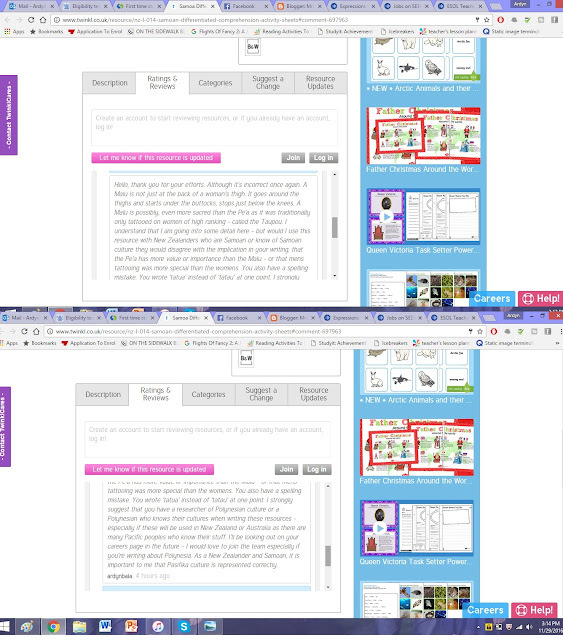 A resource I quickly downloaded and read was Twinkl's Samoa Differentiated Comprehension Activity Sheets. But I was disappointed not only with some of the inaccurate or missing information - but also the way they handled some of their communication with me. I was especially concerned at what was written about Samoan Tattoo. Although, I certainly agreed with most of the information featured, I felt they had forgotten that Samoan Tatau (Tattoo), is also very significant to women. Many Samoan women throughout history and today, have the traditional female tattoo called the Malu. As a Samoan I know about the Pe'a (Male Tattoo) and Malu but I am not an expert -just someone of the culture who knows from life experience. That was all that was written on Tatau. So I wanted to offer them some honest advice, as a Samoan woman. I felt this short description of Samoan tattoo made it sound as if only men adorn Tatau or furthermore, that it's only important to Samoan men. Which is implied as there is no mention of female tattoo. I'd think that many Samoan woman would find Tatau equally important to them as Samoan men. And I also, did my research. After pondering over the absence of the 'Malu' in Twinkl's resource I wanted to know more. I'd never questioned it before as I had knowledge as a Samoan woman who saw the Malu and had it explained to her by family members or the wearers themselves. But I wished to further understand for myself, the very importance of female Tatau - and thankfully, there are an abundance of resources online that describe just how significant Samoan Malu is to Samoan culture and identity. "The malu is also a mark of Samoan identity that Samoans find to be extremely important. Many believe it is the true signifier of a Samoan lady. In getting the malu, young women traditionally gain a variety of responsibilities. The female tattoo was traditionally reserved for the high chiefs’ daughter, the taupou, who was responsible for dancing the siva (Samoan dance) and mixing ‘ava (drink ground from root vegetable) at special occasions." "The word for a female tattoo is malu, which means to be protected and sheltered...Both male and female tattoos show that you are ready for life, for adulthood and to be of service to your community." 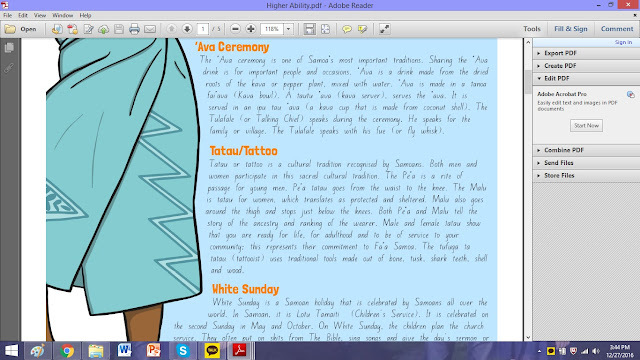 Above quote from the Australian Museum website article "THE MEANING OF TA TAU - SAMOAN TATTOOING"
There are far more journal articles and websites that explain and emphasize the Malu's importance to Samoan women and Samoan culture. A good website is also 1Samoana.com. I love that Samoa is included on this website. However, as a Samoan woman I am slightly offended that the Tatau portion of this workbook only says that tatau is important for boys. The traditional female tatau for women is called the Malu and is equally as important. The tatau for women and men in Samoa is sacred and traditional - I think it needs to be edited. Many Samoan women in NZ and the pacific wear the malu - and would disagree with this workbook. Now, their first response was excellent. I received an email to notify me that there was a response to my review and I saw not one, but 2 responses when I checked in. And they handled the review well - with a tone of care and thanks. I am really sorry to hear about this mistake, and I apologise if it has caused you any trouble. It will be changed shortly! Thank you so much for letting us know about this issue! Our lovely resource creation team have amended the resource and emailed you the corrected version. It will also be updated on the website very soon. 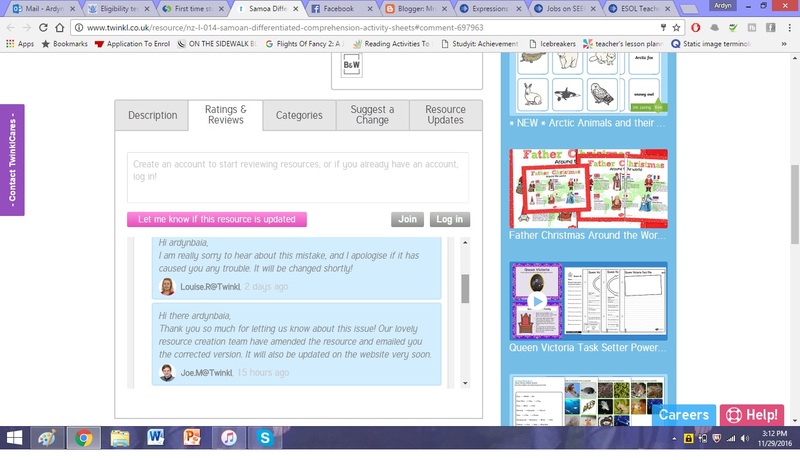 Disappointment 1 - they did indeed update the resources - but there were mistakes! If you're going to attempt to edit something, especially about someone's culture you may or may not have knowledge of, you should do it with care and accuracy. Research skills needed at Twinkl! Tatau or tattoo is a cultural tradition for Samoans. The Pe'a is a tatua that goes from the waist to the knee and is a rite of passage for young men, often telling the story of their ancestry and ranking. The malu is tatau for women, it is on the back of the thigh down to the knees, traditionally this tatau was a sign of high ranking. Tatau is a mark of commitment to Fa'a Samoa. The tufuga ta tatau (tattooist) uses traditional tools made out of bone, tusk, shark teeth, shell and wood. Disappointment 2 - With a spelling error and description error of the Malu, I had to write another review of concern. Hello, thank you for your efforts. Although it's incorrect once again. A Malu is not just at the back of a woman's thigh. It goes around the thighs and starts under the buttocks, stops just below the knees. A Malu is possibly, even more sacred than the Pe'a as it was traditionally only tattooed on women of high ranking - called the Taupou. I understand that I am going into some detail here - but would I use this resource with New Zealanders who are Samoan or know of Samoan culture they would disagree with the implication in your writing, that the Pe'a has more value or importance than the Malu - or that men's tattooing was more special than the women's. You also have a spelling mistake. You wrote 'tatua' instead of 'tatau' at one point. I strongly suggest that you have a researcher of Polynesian culture or a Polynesian who knows their cultures when writing these resources - especially if these will be used in New Zealand or Australia as there are many Pacific peoples who know their stuff. I'll be looking out on your careers page in the future - I would love to join the team especially if you're writing about Polynesia. As a New Zealander and Samoan, it is important to me that Pasifika culture is represented correctly. Now, it's my own opinion of importance that I express about the Malu - debate that with me another time, but still my concern that the Malu is not accurately portrayed and there are spelling mistakes within a Twinkl resource - that's about my culture - is justified. Of course, a little irked now, that they have made a mistake - it seemed careless, especially the spelling error. But I was hopeful that Twinkl would reply quickly and that they'd be even quicker to fix their resource. 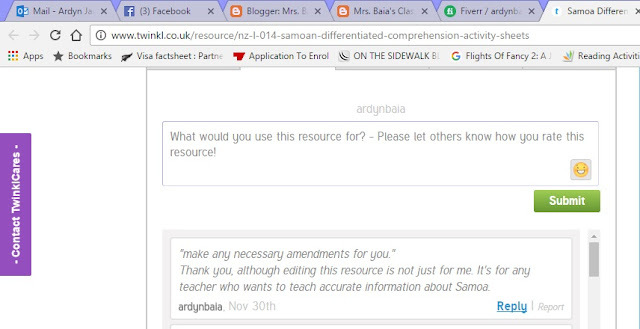 Disappointment 3 - A dull response to my concerns that seemed to miss the bigger picture - this resource is not for ME it's for all who may teach about Samoa. 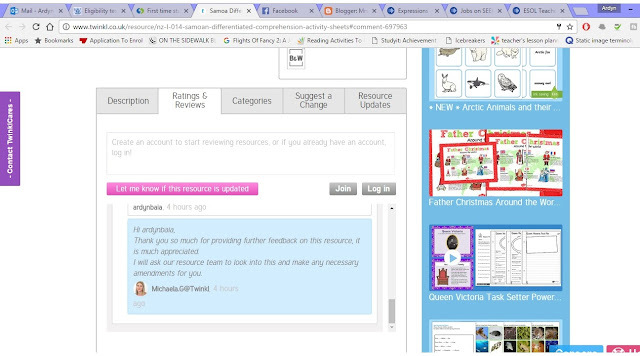 Thank you so much for providing further feedback on this resource, it is much appreciated. I will ask our resource team to look into this and make any necessary amendments for you. Now, I've chosen to highlight the last bit of her sentence "any necessary amendments for you" because it's this I have a bigger issue with than the resource being incorrect (twice). It's one thing to create resources about other people's cultures and have things missing and/or wrong - but it is another thing to imply that this resource and the amendments needed are only being made due to one person's concerns. It's for everyone! "make any necessary amendments for you." Thank you, although editing this resource is not just for me. It's for any teacher who wants to teach accurate information about Samoa. And I've received no response since. Thankfully, they did update the resource with more accurate information. You can download it now, without the errors! And you can tell they actually spent some time to research further as they added more about the Malu and it's meaning of shelter. Moreover, a real concern I have with Twinkl is their attitude as well as their Pasifika consultant or if they have one? When Michaela used the word "you" in her reply it made me feel as if I was suddenly a nuisance to her and the Twinkl site. That my suggestions to get a resource on Samoa with accurate information was bothersome and unimportant as if to say: 'it's just you, one person who is complaining'. But you know what? I am so sick and tired of this sort of response when people of perhaps, lesser known nations (smaller nations that aren't so Westernized) complain about inaccurate information being spread about our people! History, Geography and Social studies books around the world have printed the wrong information about cultures - don't even get me started on some American textbooks and their convenient omission of the word 'slave' replaced with 'foreign worker' when writing about African and South Americans in early US history. If you are going to create resources about culture and people -do it well, with accuracy and don't make the person suggesting corrections feel as if they are inconveniencing you. I helped YOU out, not the other way around. The New Zealand education system is a wonderful one and we have some fantastic statistics. Your resources on Samoa are aimed at teachers from New Zealand, teaching the New Zealand curriculum. These Kiwi teachers are a dynamic lot to be respected - and a large percentage of New Zealand teachers are Polynesian and know their facts of the pacific. So, get it right Twinkl or you will not be taken seriously amongst New Zealand educators or moreover, Polynesian people. Especially, if you are getting things wrong and having an attitude when we correct you. Other than that experience, I am still a Twinkl fan and user. I expect growing pains are a big part of any educational resource company. I do still recommend, that seeing you are expanding into resources about the Pacific, that you do employ a Pasifka adviser or a consultant.